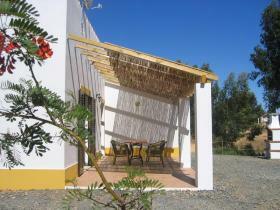 Casa Cercal is located in the sunny Alentejo region of Portugal, near Vila Nova de Milfontes and Cercal. 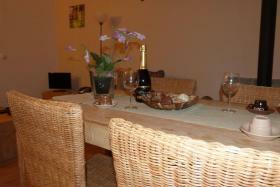 It is just 15 km from the sea and beaches. 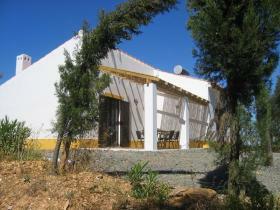 This detached house makes a great base for walking, cycling and riding holidays. The Atlantic Ocean with its rugged coastline and beautiful (private) beaches is easily and quickly accessible. 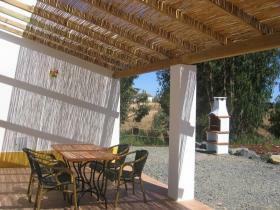 The house is suitable for 2 to 5 persons and features a romantic fireplace, making it also suitable for a holiday in early spring, late autumn and even winter. 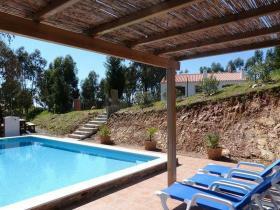 There is also a swimming pool with outdoor shower and sun loungers. 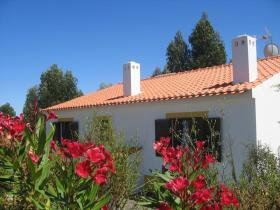 In this fair Mediterranean climate, you are in an ideal holiday environment. 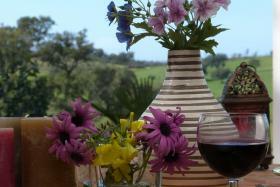 The Alentejo is a great place for both young and old. 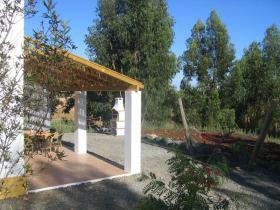 The house provides access to an additional garden room: the surrounding nature. 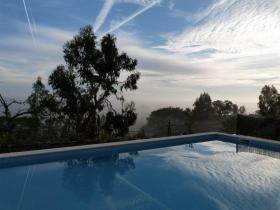 You walk into the house from under the eucalyptus trees on the huge estate. Lots of places to sit, eat breakfast and enjoy conversation. 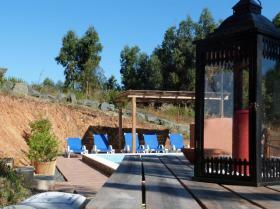 There is a lovely refreshing pool with luxurious (lounge) chairs and a playground for children. Above the Algarve lies the sparsely populated Alentejo region with its undulating plains of corn, vinyards, olive trees and cork oaks. 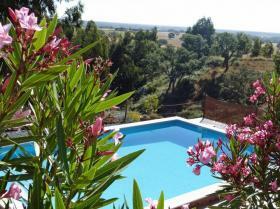 The white villages, medieval castles and lots of tranquility make this area very attractive. In the east, along the Spanish border, it is rocky and you will find beautiful castles and sleepy villages situated high up on the hills. Evora is the most famous city and has a medieval center, cathedrals, monasteries and macabre chapels with bones. 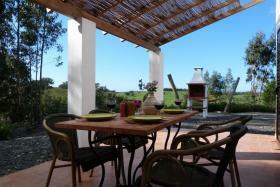 The Alentejo region of Portugal offers a pleasant climate, although it can be quite hot in summer. However, the numerous lakes and azure sea with its natural bays provide plenty of possibilities for cooling off. In the upper part of the region the great plains merge into a rocky terrain adorned with fortified villages. You’ll find many sheep grazing here and the land is ideal for viticulture. The best wines come from this part of Portugal. Besides Évora there are many villages and towns worth visiting. 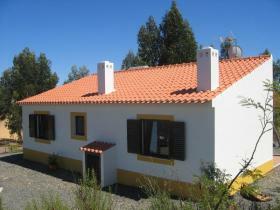 For example, Marvão and Monsaraz are considered two of the most beautiful villages in Portugal. These spectacular white medieval hamlets allow you to step back in time. 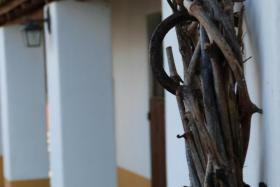 In the lower part of the Alentejo you will find cork oaks and olive trees. In the spring, the region is a sea of wild flowers while in summer the area comes alive with beautiful yellow sunflowers against a dry red soil. Beja is one of the most famous villages, with Roman ruins nearby. Mértola is a spectacular castle built on the cliffs of a village with cobbled streets. On the west coast of the Alentejo you are surrounded by nature, small fishing villages and beach resorts with beautiful beaches. 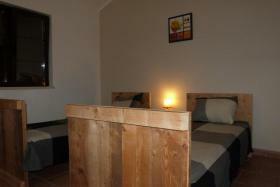 Here you will find Casa Cercal! 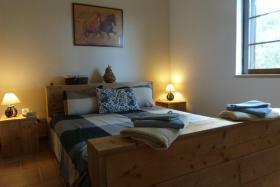 2 bedrooms: In one bedroom there is a double bed, in the other bedroom you’ll find 2 single beds. Bed linen is included. 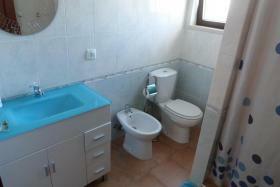 The bathroom has a toilet, sink, bidet and shower. Extra bed / playpen upon request. The modern kitchen is fully-equipped including a refrigerator, microwave, stove, dining area with table, coffee maker etc. 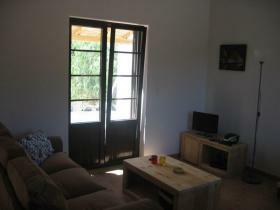 The living room contains a sofa and armchairs, radio, CD player and TV. 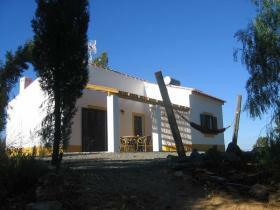 The house has a sunny south-facing terrace with a barbeque and a large hammock.